For years the supplement Saw Palmetto has been a very well-recognized and used health supplement. Saw Palmetto Extract from the plant with small berries that have been used by Native Americans as medicine and food for hundreds of years. It mainly grows around the Atlantic coastal states of Florida and Georgia. Saw Palmetto is best known throughout Europe mainly for its use in the treatment of an enlarged prostate. However according to a recent survey, at least two million men in American are using use saw palmetto for enlargement of the prostate, and it is frequently regarded as a suitable substitute therapy by the U.S FDA. It is thought that because Saw Palmetto like Propecia might inhibit 5 alpha-reductase thus it has been suggested for the treatment of hair loss. Saw palmetto in one small study demonstrated increased hair growth in six out of ten men with alopecia, closer studies also revealed that Saw Palmetto extract applied topically in a lotion and shampoo base led to a thirty-five percent increase in hair thickness, however the studies were not of a significant size and a proper larger clinical trial on androgenetic alopecia is needed. Saw palmetto is thought to be the most popular herbal supplement for the treatment of hair loss, however, it does not have the approval of the American FDA or had any significantly large clinical studies to show it does actually stop hair loss. 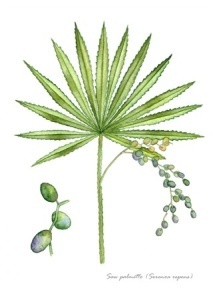 Capsules of Saw Palmetto are the most popular method for taking this herb to treat hair loss. This is probably just because this method is very easy to take and control. As well as the above, Saw Palmetto has been found to treat urinary infections in men and in women breast diseases. It has also been used to control urine flow (as a diuretic), to promote relaxation (as a sedative), and to enhance sexual drive (as an aphrodisiac). Even although Saw Palmetto is considered a completely natural supplement, it like most drugs can potentially have side effects. Side effects are usually mild. Some people have reported lightheadedness, headaches, constipation, sickness, and diarrhea. 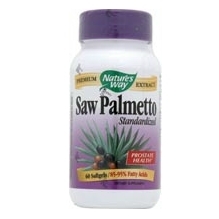 Some people have reported that saw palmetto causes impotence. Any side effects experienced as above actually showed the same results when a placebo was prescribed.